It’s Sunday before the last week in the semester. I have 4 days left in the spring semester, 4 days left in my first year of graduate school, 4 days standing between me and a glorious, glorious summer. I have two days of classes left: one Major Texts in African-American Life Since Reconstruction class in which I get to present on Ta-Nehisi Coates (very excited about that); one New Woman and Modern Feminism class left (have to finish reading Song of the Lark for that one); and two more sessions of Harlem in Vogue. I have 10 hours of work spread across 3 days left to finish checking quotes on a book chapter and editing a 30+ article. I can absolutely do it. After I summon the energy to power through these last four days, I can get myself through to the end of finals. The truth is, it’s a lot easier to write when you’re not also in classes and you don’t have to finish reading so as to contribute in class. I’m planning to sleep for a couple days after classes end, then start writing. It was so refreshing to see that, like me, Professor Ely believes in alternative scholarship and setting us an exercise that is truly beneficial. It is quite the intellectual exercise to try and imagine a dialogue between these men, given that to have such a conversation, you need to have a firm concept of each of their stances on any given issue. This requires you to have read carefully during the semester, to have thought critically and gives you the license to dress it up creatively if the mood strikes, so to speak. These papers over all are so much more fun to write than those I did last semester. I’m excited about my work and there’s nothing I’m dreading writing. Even though it doesn’t seem like much of a difference, writing 45 pages total looks a lot less daunting than wading through 60. So there’s nothing left now but to do it. The Monday after classes end, I’m going to spend some time with one of my cohort mates and we’re going to plan our writing schedule for finals. Then over the next two weeks, we’re going to get together to write, just so we don’t isolate ourselves and end up drowning in a flood of our desperate tears. It definitely seems like it’s time to be celebrating. Celebrating the conclusion of my first year, the conclusion of my Masters classes, of a semester well done. And yet it’s not quite time. I’m still looking forward. The end of the spring semester, isn’t like the end of the fall semester. At the end of the fall, your brain just shuts off for a month, trying not to think about what’s to come in January. In the spring, you’re forced to think ahead. Now is when I fill out forms for assistantships for next year (Good-bye Omohundro, hello…Lemon Project? Stay tuned to find out.) think about the best ways to not waste an entire summer. 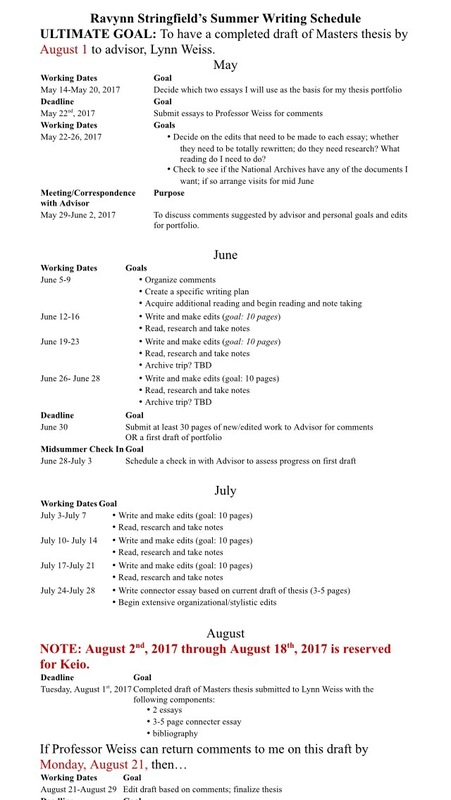 Instead of one month of rest, I have to fill 4 months this summer with academic activity of some kind. As of right now, my plans include being a Classroom Instructor for the Keio Cross-Cultural Program from August 3-August 18th and between now and then, holding down a little part-time job at Michaels, my favorite craft store. The jobs not meant to pay rent by any means, but it gets me out of the house a few times a week, gives me a welcome break from staring at my laptop and writing, and funds my art addiction. I can honestly think of no better place to work, with the obvious exception of Barnes and Noble. (I am most definitely not qualified to do anything but work at a book store, a craft store, or a coffee shop, i.e. the only things I like and am good at outside of being smart– generally speaking.) I think the jury’s still out on whether or not I’m actually allowed to have this part time job at Michaels, but granted that I’ve petitioned to have it on the basis of I need it to help keep me happy, mentally/emotionally healthy and safe this summer, I have a pretty good feeling about my summer plans. To any other Black girls out there doing grad school, just be encouraged and stay blessed: God knows you’ve made it this far and that in itself, is quite the accomplishment.